Paytm Mall, owned by Paytm Ecommerce Pvt Ltd has partnered with the Being Human E-Cycles to launch its E-Cycles on its platform. The company will host two models of the popular e-cycle – the BH12 and BH27 – priced at Rs 42,999 and 59,999 respectively starting February 18th. Paytm Mall customers can avail an inaugural offer of flat Rs. 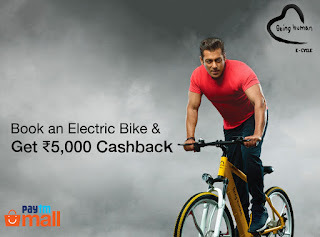 5000 cashback till 5th March. As a part of its Online-to-Offline (O2O) model, Paytm Mall has enabled customers to book their preferred two-wheeler on its platform and accept easy deliveries from over 2,000 brand authorized two-wheeler dealers across 500 cities. Being Human E-cycles will be the first electric cycle hosted on the platform, and would expand the platform’s portfolio of electric vehicles. Being Human BH 12 and BH27 e-cycles come equipped with mechanical disc brakes and adjustable front suspension. They come with LED lights. The cycles feature a pedal assist as well as rechargeable batteries. Being Human E-Cycle BH12 and BH27 models can reach a maximum speed of up to 25km/hour.